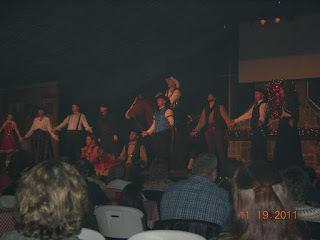 Trails and Travelogues: "Cowboy Christmas"
Have you been to a dinner show called "Cowboy Christmas"? If you did, I bet you probably had so much fun like I did! As a pre-birthday treat surprise for my birthday, courtesy of my husband, I enjoyed every minute of it. It was also a good memory for me worth cherishing because they acknowledged me as a birthday celebrant that night, although my birthday was yet 2 days early ;). At seat #228, I saw this sweet note on the table where I will be sitting. It was so nice of them to arrange this simple note on the table. I also am so thankful for the Rill's Bus Service for the coordination and effort they made especially "Lauren" our tour bus leader :). Thank you guys! By the way, they also sang their birthday song for me and Anna (another birthday celebrant) while we were on the bus ;). Our dinner was served at exactly 7pm...perfectly just in time after we were done with a little shopping from the gift shop downstairs. The show started at 7:45pm with a very good intermission song of a Christmas song by a 9-year old girl, "Hannah". It was then followed by a brief movie clip on the screen about the beginning of the drama. There is a playing of that movie clip in between the drama that was being acted on stage by their award winning actors ad actresses, vocalists and dancers. The scenes were reenacted reliving the spirit of the West...like the wild, wild west movies on the big screen...the world where cowboys live. It was actually a good drama because it carries the true message of Christmas! It was presented in a way where you can clearly track what the story is all about with a spill of a little comedy in between ;). There are many highlights that were in between the drama as well with thrilling actions of cowboy Andy Rotz, a Guinness World record holder as he amazed as with his rope-twirling, knife-throwing and gunspinning techniques on stage! He had a horse named "Idja" who also showed his antics tricks live on stage. That was amusing! Below were some captured photos that I took during the show. I am sorry, but I am not good in taking shots of shows such as this, lol! 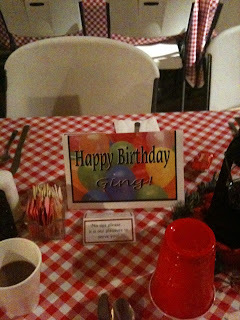 By the way, the show was held at Antietam Recreation in Hagerstown, MD. The place is located 2 miles south of Hagerstown, close to Interstates 70 & 81, and is accessible by alternate 40 and the Sharpsburg Pike. There were pre show activities that made the kids so excited while they were there such as wagonrides, there was a petting zoo, horse rides, marshmallow roasting, line dancing and old-time photos where you can get to choose your own cowboy costumes and then pose ;). 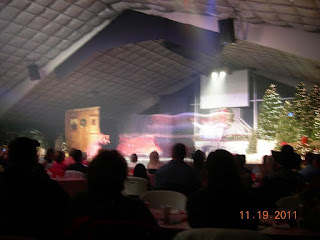 The background is in front of the stage that was fully decorated with bright Christmas trees and bows. The show is worth recommending. If you love cowboy action techniques, tricks and actions, you will be mesmerized!...what an awesome memory!